The Fox Carthay Circle Theater was one of the most famous and successful movie palaces during Hollywood's Golden Age. The theater opened in 1926 and was the site of numerous Hollywood premiers, including Walt Disney's Snow White in 1937. Changing demographics and economic challenges forced the theater to close in 1969. It was, unfortunately, torn down soon afterwards. 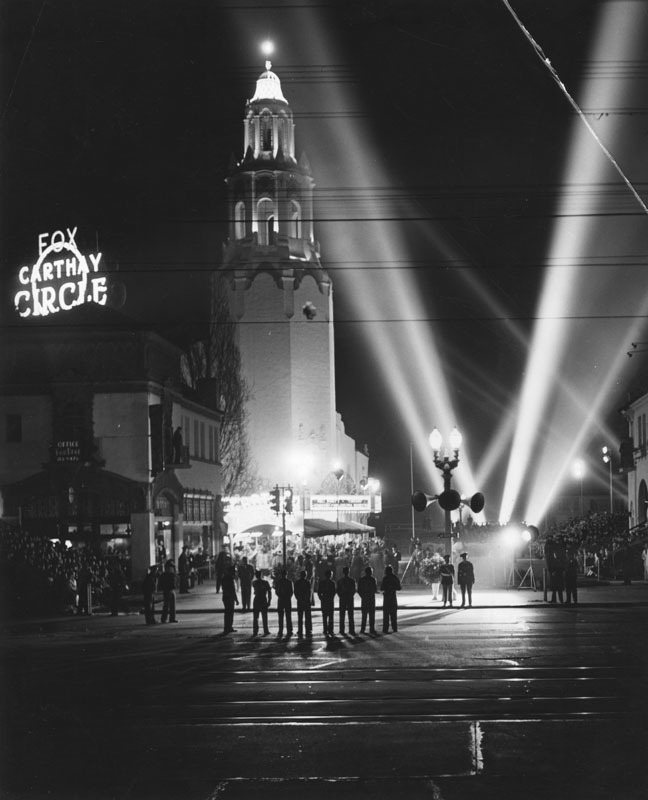 While the Fox Carthay Circle Theater is no longer around, it's "younger cousin" - the Fox Westwood Village - is. 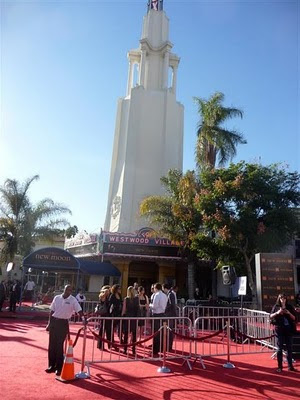 And, according to a wikipedia article, it's considered one of - if not the - best movie premiere venues in the world. 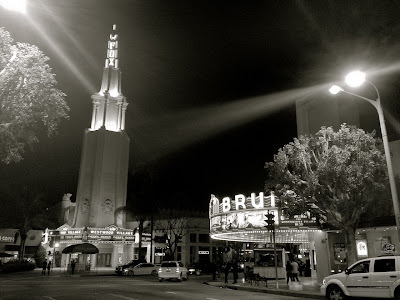 The Fox Village Theater (now owned by Regency, so it's also called the "Regency Village Theater") is located in Westwood Village, just a block away from UCLA. Back in March 2009, I took my kids to see the kid film "Monsters vs Aliens" at the Fox Theater in Westwod (here's a link to my thoughts on the film). We were there around 11am and because it was still Spring Break, it was really quiet. 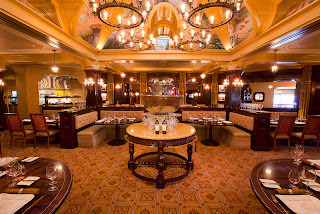 The Fox was built in 1930 and opened in 1931, just five years after the Fox Carthay Circle. When I was a student at UCLA I really wanted to find a way to climb to the top of that tower. As an aside, here's a YouTube video of actor Robert Redford doing just that, circa 1965. No climbing when we went. Just excited to see the show. This was 2009: my kids were 9 1/2 and 7 at the time. I took the rest of these photos after we saw the movie (and the small mid-day audience left). It's really a unique and amazing theater! The lobby - like everything is with this theater is massive - with some beautiful detail. The drinking fountain. Beautiful tile work. An amazing bass relief in the lobby. The gold-miner theme is again similar in many ways to the old Fox Carthy Circle Theater. I can't imagine this being green-lighted in a theater built today. But then again, The Fox Village is now over 80 years old. The steps leading up to the balcony ... and bathrooms. Along the walls upstairs: old photos of the theater from over the years. Back when it opened. Look at the car to the right. The Fox is still used for major Hollywood premiers by the Studios. Films that have had their world premier have included: James Bond, JFK, Mission Impossible, Batman, Harry Potter, Independence Day, Terminator - and hundreds of others. I was working at UCLA in November 2009, when I literally walked by the Fox Village before the world premiere for "Twilight New Moon" (no, I didn't stick around). Here's a link to what that was like. The auditorium is just massive, seating close to 1400 people. It has to be one of the largest single screen theaters in Los Angeles. And, thanks to renovations in 1999, it's in fantastic shape. I would definitely recommend seeing a movie here. Even the ceiling is impressive! The Fox Village was built just two years after sound was introduced to motion pictures. Really incredible. Yet movies are based on one thing: stories. Stories capture our imaginations, they move our heads and our hearts. They're incredibly influential. What do my kids want to hear when I tuck them in at night? A story. As a campus minister, I'm reminded that Jesus did much of His teaching in parables, stories. They were immediately remembered by His audience, and His opponents. To this day, the stories and parables Jesus told continue to transform the lives of millions of men and women, in countries and cultures the world over. A couple days after I was inside the Fox Village Theater, I had the privilege of meeting over coffee with a young film maker whose upcoming film will be showing in the Cannes Film Festival. He's a Christian, committed to bringing his faith and his world-view into what he does. Fantastic, really. I wish him all the best. The Fox was built when, aside from radio and print medium, movies were the only way of conveying story. Yet, despite advances in technology, that's what it all comes back to. Or, at least it should. 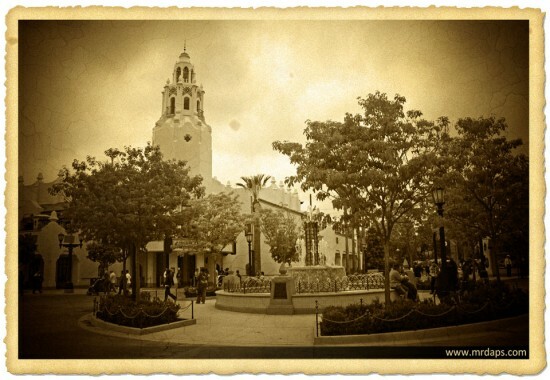 Meanwhile, if you still want to see the Fox Carthay Circle Theater, the folks from Burbank have just put the finishing touches on what looks like a spectacular replica down in Anaheim - the centerpiece of the new "Buena Vista Street" in the Disney California Adventure park, opening this weekend. Looks like they've done a great job. 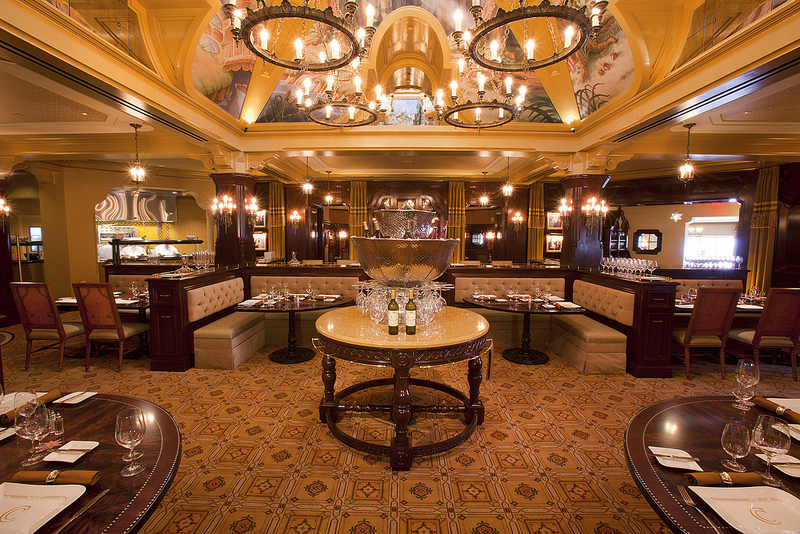 Their Carthay Circle Theater is actually a high-end restaurant, in the spirit of the old Brown Derby. Nice, but bring your wallet. If you want to experience the real deal - that is, see a film in one of the most significant movie theaters in the world, head on over the the Fox Village Theater in Westwood. Call ahead: if you time it right, you might even be able to get a glimpse of a Hollywood premiere.